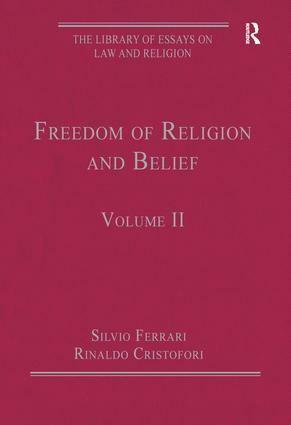 The essays and articles selected for this volume analyze what is generally understood by freedom of religion and belief in today’s world. The different aspects of this fundamental right are considered from the contents of freedom of religion, to the possible limitations of this freedom; and from the freedom of, or freedom from, conundrum to the question of the collective or individual right. This volume reflects legal, philosophical and international perspectives, addresses numerous unanswered questions and offers an effective overview of the current literature and debate in this aspect of the discipline of law and religion. Contents: Introduction, Silvio Ferrari; Part I Three Perspectives on Freedom of Religion and Belief: The development of the idea of religious freedom in modern times, Christian Starck; Religious freedoms and other human rights, moral conundrums and hard cases, Veit Bader; Freedom of religion or belief - a human right under pressure, Heiner Bielefeldt. Part II Contents and Protection of the Freedom of Religion and Belief: Freedom of religion in international law, Kevin Boyle; Regional protection of religious human rights, Natan Lerner; Limitations of freedom of religion or belief: international law perspectives, Johan D. van der Vyver; Limits to religious freedom, Rex Ahdar and Ian Leigh; Introduction, Paul Taylor; The European Court of Human Rights and religion, Javier Martinez-TorrÃ³n. Part III The Problems of Freedom of Religion and Belief: The concept of religion in the law, Rafael Palomino; The complexity of religion and the definition of 'religion' in international law, T. Jeremy Gunn; Religious liberty - freedom of conscience or freedom of choice?, Michael J. Sandel; Humanism and freedom from religion, Rajaji Ramanadha Babu Gogineni and Lars Gule; Religious liberty as a collective right, Julian Rivers; Why is there a right to freedom of religion?, Anat Scolnicov. Part IV Freedom of Religion and Belief and Other Human Rights: Tensions: Equal liberty, Christopher L. Eisgruber and Lawrence G. Sager; The struggle over accommodation, Martha Nussbaum; Liberal states and illiberal religions, Brian Barry; The freedom of religion or belief and the freedom of expression, Malcolm D. Evans; Religion, equality and non-discrimination, Nazila Ghanea; Name index. Silvio Ferrari is Professor of Law and Religion, University of Milan and Honorary President of the International Consortium for Law and Religion Studies, Italy. Rinaldo Cristofori currently holds a Post Doc position at the University of Milan, Italy and is working on his monograph at the Center for the Study of Law and Religion at Emory University, USA. The themes addressed by this series include minorities, geographical particularities, public and private sphere, secularism, apostasy, blasphemy, education and many others. The subjects are presented with different angles and viewpoints to give the readers different solutions to similar issues and offer new perspectives and material on law and religion. In addition, each of the four volumes in the series is thematically arranged to give the reader a clear idea of the different topics within the discipline and an easier access to the subjects.